Troops « Girl Scouts of Gulfcoast Florida, Inc.
Birthday parties can be easily taken for granted. Most of us can count on family and friends to come together with gifts, balloons, decorations, and of course, a birthday cake complete with candles! But for children in the foster care system, a traditional birthday party isn’t always a given. Thanks to the generosity of Girl Scouts in the Manatee 4 Service Unit, a number of local children will have everything they need to celebrate their next birthday. The girls collected and donated supplies to create “birthday kits” to be distributed to children in Manatee, DeSoto, and Sarasota Counties via the Safe Children Coalition. The birthday kits include such items as cake mix, frosting, and candles; baking pans; party hats, decorations, and favors; plates, cups, and plastic utensils; goody bags; party invitations; gift wrap; and gifts. Girl Scout troop leader Karey Papin, who works as a Registered Nurse Case Manager for the Safe Children Coalition, said that there are currently about 1,450 children in foster care or living with a relative caregiver or in facility care. “We unfortunately had a severe spike in [the number of] children this year,” she explained. With so many children and families in need, the birthday kits couldn’t have come at a better time. When the project was completed, approximately 45 kits were ready to go. That’s a lot of celebrating! “Every single person can impact the joy of children going through this experience,” Papin added. “We need and welcome more outreach projects on every level to support these families and children.” If your troop would like to learn more about the many ways they can help, contact the Safe Children Coalition at 866-661-5656. 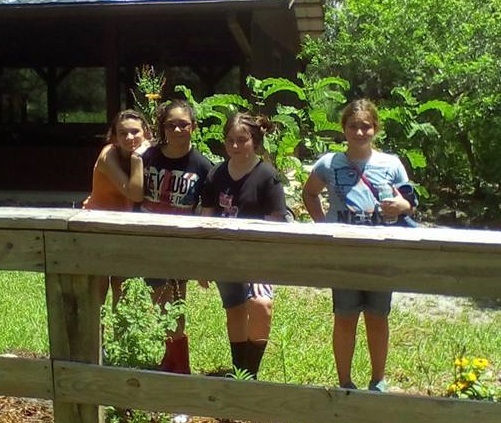 Since 2011, Girl Scouts of Gulfcoast Florida has reached out to girls living in under-served areas through fully funded Community Troops. Five years after its official launch, the Community Troop program is stronger than ever, thanks to generous community supporters and volunteers. The Wilson-Wood Foundation was one of the first to support Community Troops in Sarasota and Manatee Counties. Their 2015-16 grant of $15,000 has made possible a variety of programs and experiences for Community Troops from Gocio and Tuttle Elementary Schools, Booker Elementary and Middle Schools, Greater Hurst AME Chapel, and the Laurel Civic Association, as well as Palmetto Elementary School and the DeSoto Boys and Girls Club. So, what does a Community Troop do? Everything! From field trips in the community to outdoor programs, service projects, earning badges, and more, girls in Community Troops enjoy all that Girl Scouting has to offer. A few highlights from this year include visits with the Sarasota Garden Club and Sarasota Police Department, a special camp day at Honi Hanta, and end-of-year troop celebrations. The Community Troop program is also thriving in Lee and Collier Counties. All told, there are 32 Community Troops with 532 girls council-wide. Support for Community Troops in 2015-16 has come from a variety of sources, including The Wilson-Wood Foundation, Schulze Family Foundation, Suncoast Credit Union, Jerome and Mildred Paddock Foundation, the League Club, Kiwanis Club of Longboat Key, Collier County Bar Foundation, and United Ways of Suncoast, South Sarasota, Collier County, and Lee/Hendry/Glades Counties. Troop 1083, led by Helen Sundgren, meets at Anthony Park in Naples. When they learned the park was named in honor of PFC Charlie P. Anthony, they wanted to find out more. They discovered that PFC Anthony had grown up on the very street where the park is located, and that he had served in Vietnam, where he lost his life in 1969. Wanting to share this piece of history with others, the girls made posters about Anthony to display at the park. They recognized him on Veterans Day and his birthday. When one of the Brownies in the troop told her grandmother about Charlie Anthony, the grandmother told her she had known him and she came to speak to the girls at a troop meeting. After learning more about this local hero, the girls thought the whole community should know about Charlie Anthony and his service to our country. After talking with Anthony’s family and showing pictures of the posters they had made to the City of Naples Community Services Department, Parks and Recreation staff, and the City Council, it was agreed that a plaque should be placed at the park in his honor. A ceremony to unveil the plaque was held on Saturday, March 12, 2016. City of Naples Mayor John F. Sorey III led the program. Cadette Girl Scout Jennifer P. of Troop 1083 spoke about their troop’s involvement in the project. The Macedonia Baptist Church youth choir, including several Girl Scouts, performed for the crowd. And members of the Anthony family traveled from around the country to participate in the celebration. Members of Troop 1083 with leader Helen Sundgren and co-leader Anna Gil. What started as a simple history lesson grew into a community-wide project, spearheaded by Girl Scouts. Thanks to the girls in Troop 1083, we are now much more aware of PFC Charlie P. Anthony’s legacy and his place in the history of Anthony Park.